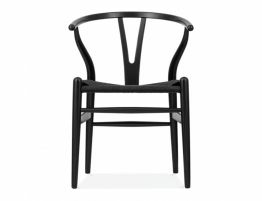 The Relax House Laak wood dining chair is a classic dining chair with a cushioned, black upholstered seat pad and timber frame. 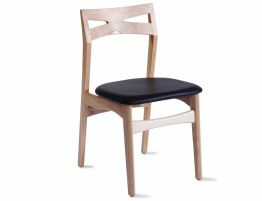 This tasteful dining chair is featured here in a warm natural ash wood. The striking design takes the form of a curved, Dragonfly wing back. This elegant, natural shape combined with the beauty of the materials, lends the chair a refined, organic feel. The Laak dining chair would fit in very well in a contemporary home dining room, paired with a classic wood dining table or any Danish inspired piece. 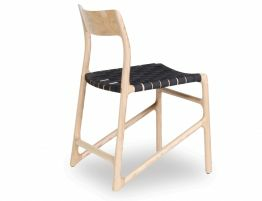 The natural ash and black seat pad give this chair a rich, minimal feel. 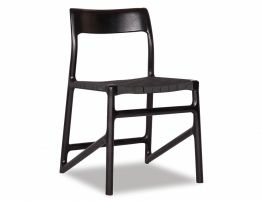 This is an impeccably constructed dining chair. This chair could also stand in easily as a handsome, armless desk chair or an accent chair in a hall or bedroom. If your desk is in an open living space, replace your ugly, worn chair with this work of art. 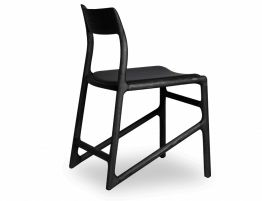 Or use the Laak dining chair in a commercial environment, maybe an upscale waiting room or an elegant cafe. Our gorgeous timber chair is built to last. 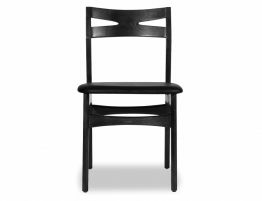 Our Danish Designer Dining Chair looks a bit like the HW Klein Bramin dining chair. Our take on the inspired chairs of Hans Wegner and Poul Volther, our Laak upscale dining chair seamlessly marries the classic tapered lines of Scandinavian design with a contemporary minimal silhouette, which make this dining or side chair an obvious choice for many different interiors. 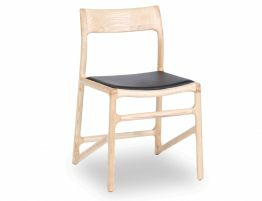 Restaurants have long recognized the Danish style Laak dining chair for its comfort, its armless, space minded size and upscale good looks. Our Laak Dining chair seamlessly mixes with other Scandinavian design and with its classic look and expert craftsmanship, these are chairs that will stand the test of time.